NEGROMANCER 2.0: "Hunter x Hunter" Anime Set for Cartoon Network's "Adult Swim"
"Hunter x Hunter" Anime Set for Cartoon Network's "Adult Swim"
San Francisco, CA – VIZ Media, LLC (VIZ Media), the largest publisher, distributor and licensor of manga and anime in North America, excites action/adventure fans as it announces the launch of the all new HUNTER X HUNTER anime series on Adult Swim’s Toonami. In the HUNTER X HUNTER anime series, abundant riches, hidden treasures, fearsome monsters, and exotic creatures are scattered around the world... Gon departs on a journey to become a Pro Hunter who risks his life in search of the unknown. Along the way, he meets other applicants for the Hunter exam: Kurapika, Leorio, and Killua. 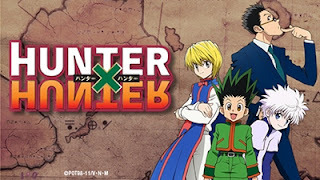 Can Gon pass the rigorous challenges of the Hunter exam and become the best Hunter in the world!? His wild and epic journey is about to begin!! Headquartered in San Francisco, California, VIZ Media distributes, markets and licenses the best anime and manga titles direct from Japan. Owned by three of Japan's largest manga and animation companies, Shueisha Inc., Shogakukan Inc., and Shogakukan-Shueisha Productions, Co., Ltd., VIZ Media has the most extensive library of anime and manga for English speaking audiences in North America, the United Kingdom, Ireland and South Africa. With its popular digital manga anthology WEEKLY SHONEN JUMP and blockbuster properties like NARUTO, BLEACH and ONE PIECE, VIZ Media offers cutting-edge action, romance and family- friendly properties for anime, manga, science fiction and fantasy fans of all ages. VIZ Media properties are available as graphic novels, DVDs, animated television series, feature films, downloadable and streaming video and a variety of consumer products. Learn more about VIZ Media, anime and manga at www.VIZ.com.